Managed cloud services may still be one of those areas in technology that still intimidate some insurance agencies and their owners. But the convenience and flexibility of cloud service offerings can no longer be ignored without running the risk of an agency growing hopelessly out of date. Managed cloud services can mean many different things; for the purposes of this post we’ll look both at the Internet as a managed cloud and an IT-vendor partnership to manage your on-site and cloud-based technology needs. Together, these two services can be the one-two punch that knocks out inefficiencies in your IT infrastructure next year. This post explores the case for insurance agencies to move toward managed cloud service in 2018. It will explore three of the top managed IT services including security, help desk, and managed networks. Let’s tackle this elephant in the room right up front. 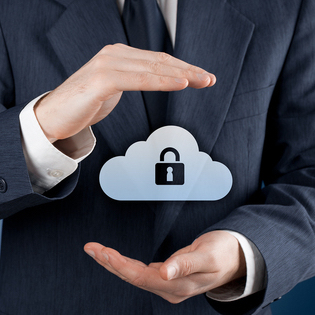 There is nothing wrong with asking questions about data security in managed cloud services. But using the issue as an excuse to prevent your migration to the cloud simply isn’t feasible anymore. That’s because cloud service providers make it their business to keep data secure from external threats. They offer integrated load balancing and monitoring to redirect traffic from trouble spots in the network, just like a highway construction crew diverts traffic during a detour. Equipment failure or weather, hacker breaches, or increases in service usage can cause weak points in any information superhighway. If any of these things occur in a small business, the network will slow or grind to a halt. But this is so rare as to be non-existent in the area of managed cloud services. Automatic system updates keep data more secure by staying on top of the latest threats from hackers. These are all reasons these providers offer more security, not less than the typical mix-market business – and certainly more than a small agency can afford to assemble. Managed cloud services in 2018 will continue to be the go-to choice for all business sectors in 2018. A cloud provider like Microsoft or Amazon Web Services can attract the best in IT talent and afford to employ the latest technology. When you combine these service providers with a third party vendor to manage your network, it becomes a tough-to-beat combination that ensures data security in the cloud. Wondering if your business data is secure? Get a free assessment of the security of your IT network. Managed cloud services can also include an outsourced IT help desk service that is particularly valuable as a customer support tool. Having an after-hours IT help desk is one way to assist clients in the areas of claim management and general support. Insurers that want the added support to solve customer problems or respond to customer requests, turn to IT help desk support as part of a managed cloud services offering. A third party IT management provider like TOSS C3 can not only help migrate your data to the cloud but can design a service offering to include automation or direct access to service 24/7. Managed cloud services are different from managed network services. The former handles how you experience the internet as you move between servers in the cloud. The latter manages your connection to the internet, your on-premise or online hardware and software (possibly including cell phones), along with disaster recovery, and even the cloud vendors themselves. If this is confusing think of it this way: Cloud service providers are like the Interstate highway, while a managed IT service vendor handles the side roads and the vehicle that gets you there. It’s a lot harder to manage a business without both types of providers – especially small businesses who often can’t afford IT talent. The managed cloud service market will generate more than $256 billion in 2018. While that startling number should not sway those that remain stubbornly averse to cloud migration, it does illustrate the likelihood that competing businesses have taken or will take advantage of managed cloud services next year. Managed cloud services offer fixed pricing and lower costs for businesses by eliminating the need for costly hardware and software. Cloud managed services are typically offered as a subscription service. These services have allowed even the smallest agency to remain competitive, as technology has advanced. To learn more about subscription-based services, download the white paper IT as a Utility. Contact TOSS C3 for the technology and industry expertise you’re seeking to make 2018 more profitable. Request a quote on managed cloud services now.